Scored this perfect e (for eastman) for the boys playroom at Unified Groove Merchants in Spokane, on Monroe St. Awesome price, and even better it's from an old Shell gas station, which I think are now extinct in this area. Gas + boys= love. My favorite coffee can, it is rusty inside, but the graphics, oh my!! I saw the matching large can at my sister's house today, along with an amazing red and white Big Valu Coffee can. Hmmm. my sister!! Vintage coffee cans, what can I say. Affordable, graphic, happy collection!! I have to part with this one due to space, so it will be in my booth at Funky Junk!! Found these at The Vintage Rabbit, my longtime favorite in Spokane...I went in with posters for the show and came out with this big splurge!! I know the boys will love them for camping, and I love them period. I am slowly, quietly building my vintage & retro salt and pepper shaker collection to house my building glitter collection...My junker/scrapping friends Jennifer Wood & Christy Dunham are years ahead of me with this idea-thanks girls!! I think it will be my favorite thing to search for at my show! Love old crepe paper and love old crepe paper package design! This is part of my spring display. I wish I hadn't have sold my green package...and wish I would have bought the amazing crepe paper store display I found once upon a time!!! Love this little guy; he was one of my very first finds, and I had a vintage squeaky toy display in each of my nursery's...but now my youngest is 2 and we are changing to little boy vintage, so wave bye-bye to me; hello to your new home cutie! Bought from some of my all time Farm Chicks vendors, Forget-Me-Not Nancy & Sally, I think it is coming to Funky Junk to find a new home. Those girls always have THE BEST junk!! Perfect blue three shelf vintage side table I bought from my mom at Funky Junk; just not sure if it fits in my new office, so it is going to Funky Junk! My very first junky project, even before being a Farm Chicks vendor! This was a window from the old family farmhouse. Probably going in my office to stay. We all come from somewhere, from some mix of genes and nationalities that make up the who of who we are. I have tended to bond more closely to some parts of my geneology and family history than others; particularly the small portion of Irish in me. I think in my mind I've worked it out that I am 1/32nd "full" Irish. Who knows how close my math is, especially considering it is not my strongest subject. But how I do love that sliver. So, we celebrate St. Patrick's Day at my house; especially since I named my sons all Irish names: Haden after my full-blooded great, great grandfather Thomas Haden; Liam because I just love that Irish name; and Finn, because I had a vision of that name shortly after Liam was born, and it came back to me when we were searching for a name for our third boy. Is it normal that my 1/64th part Irish boys think they are all Irish? All I'm sure of it that they carry the passion, humor and names of a land I've never seen but dream is my home. Funky Junk In Coeur d' Alene!! It's true, it's poster and show time; that bright season that comes two times a year, spring and end of summer. I love unveiling our posters and postcards, they always have been true works of art. Our graphic designer, Heidi Jantz, happens to also be my middle sister. She not only is really, really talented; but she really, really gets Jennifer and I, our sensibilities, our approach to junking and life; it's just win-win all around. So about a month before our shows we like to do what we call "wallpapering the Northwest" with our invite to our junking weekend. This past weekend I jumped at the chance to take a short road trip over to Coeur d' Alene, ID with my mom for postering. Of course, before we got out of town, Spokane, we made a few quick stops to This Old House on Trent, where mom picked up a side table and to the new "The Mad Cow" next door. Things on my need list from there: AMAZING blue cupboard to hang in my office, lots and lots of reallly cool jewlery, black and white bench for office. In the meantime mom and I grabbed some vintage player piano music rolls for scrapbooking. 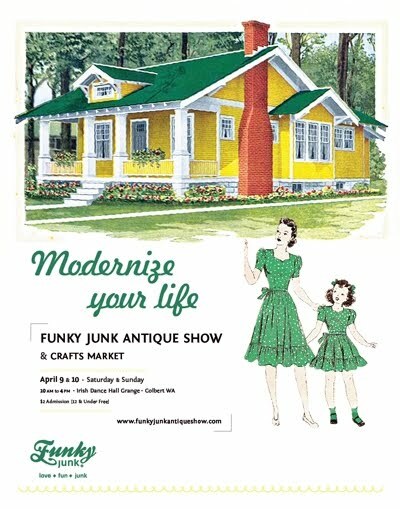 Doesn't Heidi Billman (the owner) look super cute with the Funky Junk poster and that letter! We would have also visited All That Glitter, but Holly and Becky were at Custer's (where I visited them the next day). What a beautiful booth they always pull together-I loved the white and green and blue and pink-gorgeous, just like those talented girls! When mom and I finally traipsed to CD'A we hit as many off the antique stores and coffee shops as we could, but saved our favorite for last: Forget Me Not. Nancy and Sally have been longtime junking mentors and truly friends. And their store always, always has a treasure I cannot leave without. I loved the full camping/thermos set, antique chandelier, and rare cream-colored mixer; but what I came home with was the perfect mirrored vanity for my master bath. Mom loved the fabric tied to an old mattress on the porch ceiling, so I posed. We loved getting to sit and chat and laugh with Nancy and Sally for bit before heading home, junking is always made sweeter with friends. So, today, my sweet husband hung my very own, grown up, perfect sized, meant for me, vintage vanity. Sometimes I can't believe how blessed I am to get to travel and junk and spend time with friends in person and online, and call it "work". How lucky can a girl get?